By the early nineties, so called conservative Catholic journalism throughout the Anglophone world had well and truly become Neocon occupied territory. 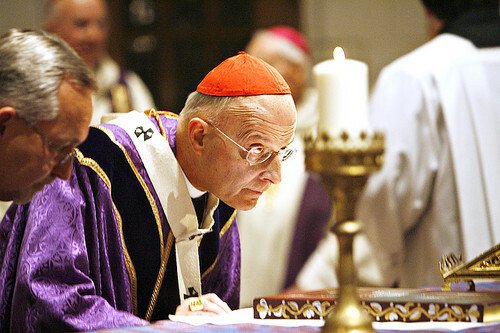 In 2007, Cardinal Francis George of Chicago responded to calls from organized Jewry for the Catholic Church to abandon its prayer for the conversion of the Jews, by suggesting that the Jews themselves might consider removing anti-Christian passages from the Talmud (I). A short time later Cardinal George found himself accused of “covering up” sexual abuse in his diocese. As coincidences ago, this is right up there with the former British Foreign Secretary, Robin Cook, dying suddenly weeks after writing in the Guardian that “Al Qaeda” was just another name for the CIA’s Arab assets (2). But hang on, I hear you say, surely the trad Catholics are right to blast the Church over its cover-ups of heinous crimes? Well, yes, when the crimes have been proven in a court of law – not, as in the case of the recent Pennsylvania hysteria – when most of the cases have never been tried at all. There’s an absurd contradiction at the heart of traditionalist and conservative Catholic denunciations of bishops and the “Catholic establishment” over the clerical scandals: in many of the cases they condemn the bishops for “covering up”, it is the bishops and their bureaucrats who have summarily found priests – living and deceased – guilty, without a proper investigation – much less a trial – ever having taken place. Thus, on the one hand, the trad Catholics unquestioningly accept the utter nonsense of men and women who have no authority or expertise whatsoever to adjudicate on criminal matters, pronouncing the guilt of priests who have never been tried in a court of law. Then the same trads hysterically chimp out about the bishops and bureaucrats “covering up” the crimes of priests – when the only authority they have to substantiate these priests’ guilt is the word of this same Catholic bureaucracy. It’s safe to say that most folk, including most Catholics, know nothing, and care less about the “Catholic traditionalist movement”. But that doesn’t stop this “movement” exerting a subtle but devastatingly masochistic influence on the wider Catholic culture. Indeed it’s not going too far to say that if the Catholic trad movement didn’t exist, the globalists would have had to invent it. Then again perhaps they did.